Sean Spicer, the former White House press secretary whose full-throated defense of Donald Trump earned him derision on television, delighted his former tormentors in a surprise appearance at Sunday’s Emmys. Spicer, who resigned in July in one of the many shake-ups of Trump’s White House, was the highlight of Stephen Colbert’s opening monologue which took a heavily political tone. The remarks were a reference to Spicer’s jaw-dropping assertion at the very start of his tenure that Trump’s inauguration was the most attended ever, pressing the president’s claims despite photographic evidence to the contrary. 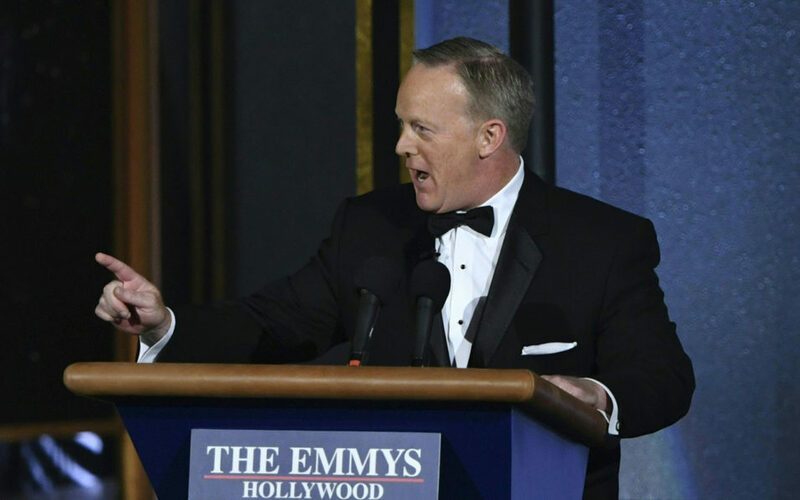 Spicer’s tongue-in-cheek cameo stunned and delighted the Emmys audience including “Saturday Night Live” comedian Melissa McCarthy, who picked up a Creative Arts statuette for her “Unhinged Spicey” impersonation of him. Spicer’s appearance was all the more startling as both he and Trump had criticized “Saturday Night Live,” complaining that the popular NBC show was out of line for its persistent satire of the administration. “Saturday Night Live” won Sunday for best variety sketch series, the show’s Kate McKinnon a.k.a. Hillary Clinton won as best supporting actress in a comedy and Alec Baldwin was tapped as best supporting actor in a comedy for his Trump impersonation. Baldwin, speaking to reporters backstage after winning his award, praised Spicer for having the good grace to turn up before the liberal-skewing Hollywood crowd. The comedian quipped that the crowd at the Emmys bore responsibility for Trump as he may not have sought the White House had he won an award. “But he didn’t. Because unlike the presidency, Emmys go to the winner of the popular vote,” he said, touching another sore point for Trump.